Shapiro BJ et al. (2012) Science. Szabò G et al. (2012) The ISME Journal. In these 3 publications, we describe the first empirical data from natural bacterial populations to address a fundamental question in microbiology: whether advantageous mutations lead to selection of clonal genomes or, as in sexual eukaryotes, sweep through populations on their own. Specifically, we showed that in two recently diverged populations of marine vibrio bacteria, ecological differentiation has occurred akin to a sexual mechanism: A few genome regions have swept through subpopulations (associated with either large- or small-particle microhabitats in the water column, respectively) in a habitat-specific manner, accompanied by gradual separation of gene pools, as evidenced by increased habitat specificity of the most recent recombination events. These findings reconciled previous, seemingly contradictory empirical observations of the genetic structure of bacterial populations and point to a more unified process of differentiation in bacteria and sexual eukaryotes than previously thought. Most recently, we developed a computational model to account for the observation that just a few loci seem to drive ecological differentiation. In simulated microbial populations, we observed an evolutionary tradeoff between early and late stages of niche adaptation, which is resolved when relatively few loci are required for adaptation. 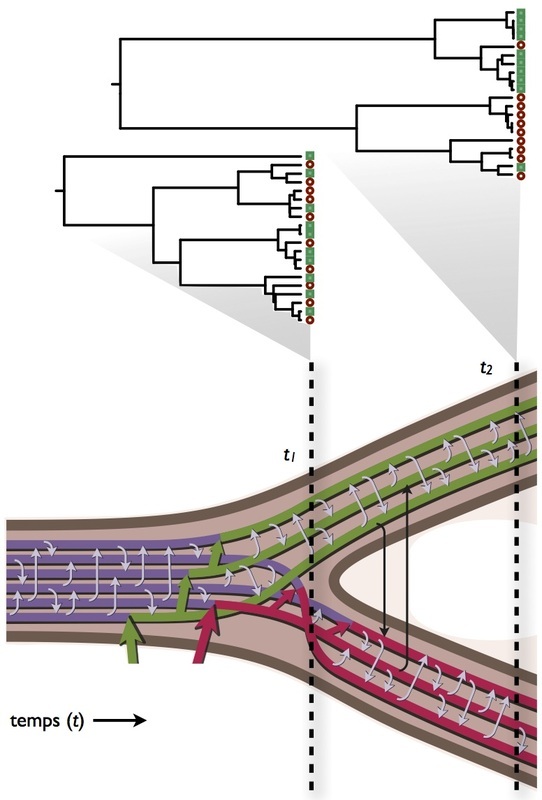 At early stages, recombination accelerates adaptation to new niches (ecological speciation) by combining multiple adaptive alleles into a single genome. Later on, without assortative mating or other barriers to gene flow, recombination generates unfit intermediate genotypes and homogenizes incipient species. The solution to this tradeoff may be simply to reduce the number of loci required for speciation, or to reduce recombination between species over time. The contribution of this model is that it makes explicit how a similar result (few loci involved in sympatric speciation) may come about in both sexual eukaryotes and recombining microbes, but for subtly different reason.